As a reminder, our savings goal for 2017 is 35% and we are struggling to reach the 35% goal in 2017. This has been caused by an increase in car repairs, daycare costs and other unexpected expenses. Even though we are struggling to reach 35%, we are still saving every month! That's the most important thing! Let's jump into our July spending report. July is the third month in a row that we have not met our savings goal. In all reality, this month did not have many surprises. Other than car registration, half-marathon registration and other miscellaneous expenses for my daughter, we spent about average on all other expenses. This month, we were really hit with a lot of little expenses and nothing major. Maybe 25-27% is a better savings goal for our family. We'll keep you posted in the future. Let's see if there is any improvement in August. Well look at that, we didn't even hit a 20% savings rate in August. With August being the first month of our 'buy nothing new challenge,' you would hope that our savings rate would increase. However, we were hit pretty hard with some unexpected expenses, which caused our spending to spike (insurance and auto repairs). With our insurance expense, we went from an insurance company that charged monthly to one that offered a discount if you paid the whole year in full. I took the deal and paid for the whole year in full (unexpectedly). In terms of auto repairs, it seems like our cars have been hit pretty hard with repair expenses (another $800 in August). Could September be better? We are now on a 5 month streak of missing our savings goal, despite our 'buy nothing new challenge.' In September, you can see that the savings was decreased by our travel expenses and some more auto repairs (shocking, right?). In September, we traveled 4 out of the five weekends. This included hotel stays in three different cities (Laredo & Kemah in Texas and Salem, OR). All of these trips were preplanned and we kept our expenses as low as possible. 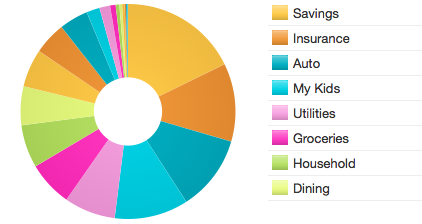 Over the last three months, we did not hit our savings goal in any month. This has caused our savings rate to drop 1 point to 25% since June. Below is the complete data of the yearly spending rate. Nine months into 2017, we find ourselves 10 points under our savings goal. We are running out of time in 2017 and hitting our goal of 35% may be out of reach. How does our low spending rate effect our FIRE Prowess Score? Despite our low savings rate in 2017, our FIRE prowess score is above 50%. This score basically means that our net worth increase is 56.7% of our income. Due to our low savings in 2017, this means our increase in net worth has come mostly from growth on our investments (not too bad in my book).